In most of Switzerland, Carnival is known as Fasnacht, a variant of the Swabian-Alemannic word Fastnacht, meaning night of fasting. The reference is to the fast mandated for Catholics during the 40 days beginning on Ash Wednesday. Fasnacht is celebrated throughout the Catholic regions of Switzerland, and it frequently includes masked parades and other traditions. The city of Lucerne no longer preserves its masking traditions, but they remain alive and well in Kriens, a town in the greater Lucerne Canton. The European masked Carnival dates back to the medieval age, but the Catholic Church banned these festivities during the Counter-Reformation in the 16th century as a reaction to the Protestant Reformation. Carnivals reappeared in the late 18th century and have been continuously celebrated in Kriens using masquerade for at least the last 150 years. During the Carnival, citizens parade en masse to band music while wearing totemic masks unique to their specific guild. Parade characters can include almost anything, such as bears, witches, goblins, or miners. 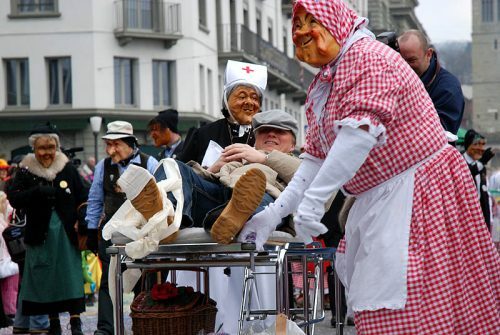 Other participants in the Kriens Carnival parade individually or in small groups, playing tricks on bystanders and clowning generally. These tend to wear either of two forms of masks, hand-carved from wood (usually lindenwood), with subtle paint and a lacquer glaze on both sides. One kind is the “character” mask, which can represent a specific stereotype for satirical purposes. Such masks tend to have a crafty or mischievous smile. Popular characters include the Wöschwyb (washerwoman), Bärnerwyb (a female camp follower from Bern during the Napoleonic era), or Alti (old man). 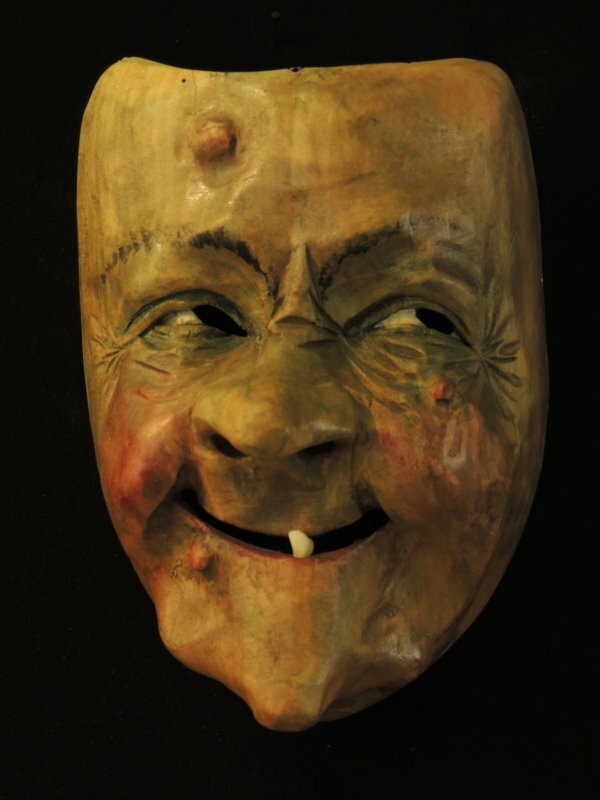 A 1950s character mask from the master carver of Kriens, Alois Blättler. 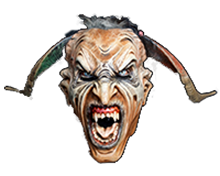 The other kind of mask is known as a Schreckmaske (fright mask), also known as the Krienser Deckel (Kriens head). These have narrow faces with large eyes and frowns. Unlike the comical characters, the fright maskers are intended to be scary, because they represent unnpopular French soldiers from the Napoleonic invasion of Switzerland. It is thought that the mask was conceived by combining images of these soldiers with traditional beliefs about forest spirits (Waldgeisten). The Buuremaa or Puuremaa (farmer) character wears a very similar mask, but the costume worn is different. Unlike the fright masker, who wears a tree bark hat and carries a wood truncheon, the Buuremaa wears a wide-brimmed hempen hat and a coat of animal skins. Other regions of Switzerland have different masking traditions. In Flums, the wooden masks tend to have an abstract and simple appearance. The famed wooden Tschäggätta masks of Lötschenthal have a savage and often primitive look to them. Masks in Appenzell come in both “ugly” and “pretty” varieties and are made from natural materials or cloth dipped in wax. Masks from Basel are large helmets made from paper maché and represent colorful, cartoonish characters. Despite its small size, Switzerland has exceptionally diverse masking traditions! Masqueraders clown a “first aid” scenario in a modern Kriens Carnival. 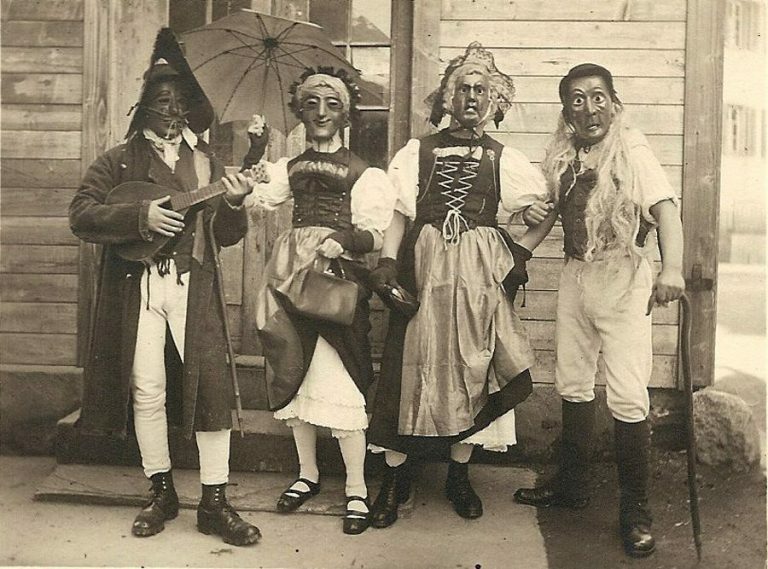 This Carnival group from Kriens around 1910 has traditional masked characters still in use today. 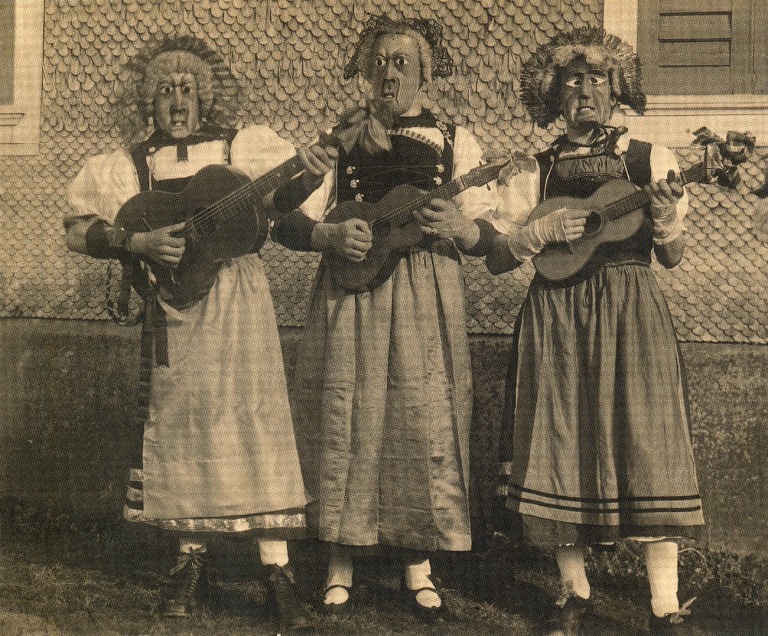 A 1925 Carnival group of Bärnerwyber with zithers. 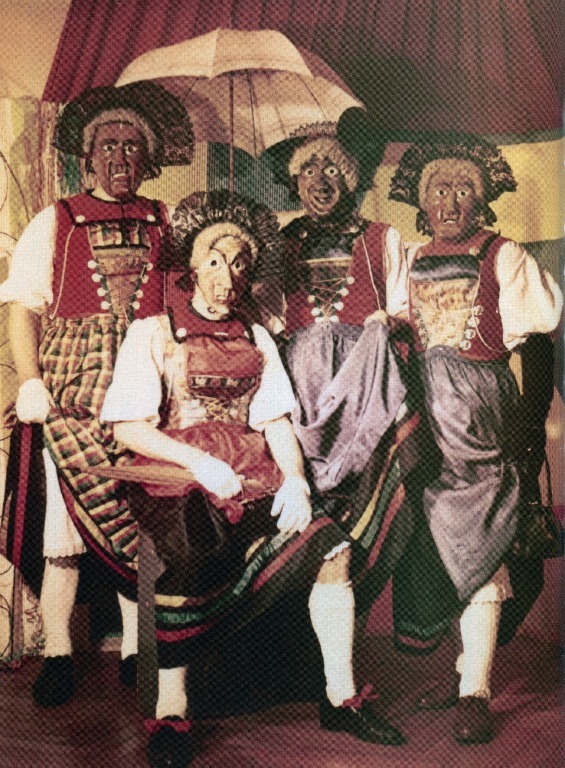 A Kriens Carnival group from the 1960s.